Transitional Deacon Jerry Byrd kneels at SS. Peter and Paul Cathedral in Indianapolis to receive a blessing from Bishop Christopher J. Coyne, apostolic administrator, prior to proclaiming the Gospel during a celebration of an Easter Vigil Mass on April 7. Bishop Coyne will ordain Deacon Byrd a priest on June 2 at the cathedral. (Photo by Sean Gallagher) Click for a larger version. In every celebration of the Eucharist, bread and wine are miraculously changed into the Body and Blood of Christ in the moment when the priest prays the words of consecration. In that same moment during a Mass celebrated in 1998, a high school junior from southeastern Indiana named Jerry Byrd was also changed. Raised as a Baptist, Byrd was attending a Mass with a friend who was preparing to become a Catholic. But when he heard the priest say those words and saw the priest elevate the host, Byrd was also changed. He knew beyond a shadow of a doubt that it was Christ who was before him. Emmaus is the name of the town to which two of Christ’s disciples were walking on the first Easter. The resurrected Christ walked with them and ate with them. They only recognized him when he blessed and broke bread (see Lk 24:13-27). That moment in 1998 led Byrd to become a Catholic and eventually a seminarian for the Archdiocese of Indianapolis in 2006. When asked what it will be like for him to say those words that transformed him in 1998 and to lift up that host, Deacon Byrd, who is an admitted extrovert, was at a loss for words. But it might not have happened at all if it weren’t for the convictions of his mother, Rose Byrd of Bright. When she and her now late husband, Mick, were expecting the birth of Jerry, their fifth child, doctors told them that he had Down syndrome and would be rather sickly when he was born. Therefore, they advised them that Rose should have an abortion—a suggestion she flatly refused. As it happened, Deacon Byrd was healthy and free of any abnormality when he was born. This brave, pro-life choice by his mother has given strength to his own pro-life convictions to this day. And it’s affected Deacon Byrd’s view on vocations. In light of her experience at the start of Deacon Byrd’s life, Rose Byrd is emotional when she talks about her son coming to know and embrace God’s purpose for him as a priest, which she wholeheartedly supports. “It’s an awesome thing that the Lord has done,” she said, holding back tears. “I hope that he will follow the Lord and do what the Lord put him here to do. And that is to work for him and lead others to him. One of the gifts that God gave Deacon Byrd by which he has sought to draw people closer to him is his love for music and other forms of art. He started playing the piano for his Baptist congregation when he was 13. And he has either composed or arranged nearly all the music that will be sung at his Mass of Thanksgiving, which he will celebrate at 2 p.m. on June 3 at St. Louis Church in Batesville, his home parish. Deacon Byrd has also designed and sewn the vestments that he will wear during that liturgy. For nearly 20 years, he has led congregations in singing during worship as both a cantor and accompanist. That changed when he was ordained a transitional deacon last year. But Deacon Byrd is convinced that his love of music and the arts will continue to play a vital role in his priestly life and ministry. During his six years of priestly formation at Saint Meinrad Seminary and School of Theology in St. Meinrad, Deacon Byrd used his musical gift at St. John Parish in Osgood, where he stayed when he had breaks from classes. Father Shaun Whittington, St. John’s pastor, welcomed Deacon Byrd to stay in the parish’s rectory during that time. Their friendship has been fruitful for both of them. Beginning in July, Deacon Byrd will be busy in his first pastoral assignment as a priest as associate pastor of St. Barnabas Parish and Catholic chaplain of the University of Indianapolis, both in Indianapolis. But Father Whittington is convinced that his relationship with his friend won’t suffer as a result. He is also looking forward to seeing how Deacon Byrd will attract those to whom and with whom he will minister closer to God through beauty and the arts. “He’ll be able to help people understand true beauty and the beauty of God and the beauty of creation,” Father Whittington said. “That’s another aspect of how God reveals himself. Father Peter Marshall is reminded of his friend’s artistic talents every time he puts on the vestments that Deacon Byrd designed and sewed for him. “Every time I wear them, I’m prompted to say a prayer of gratitude for Deacon Byrd, and his ministry and his life,” said Father Marshall, associate pastor of St. Pius X Parish in Indianapolis, who begins a new ministry assignment as administrator of Our Lady of the Most Holy Rosary Parish in Indianapolis on July 3. He thinks that Deacon Byrd’s love of beauty and its connections to the life of faith will help others be drawn closer to God and the Church. For Deacon Byrd, love is at the heart of all that is beautiful, including his priestly vocation and the calling of every Christian. 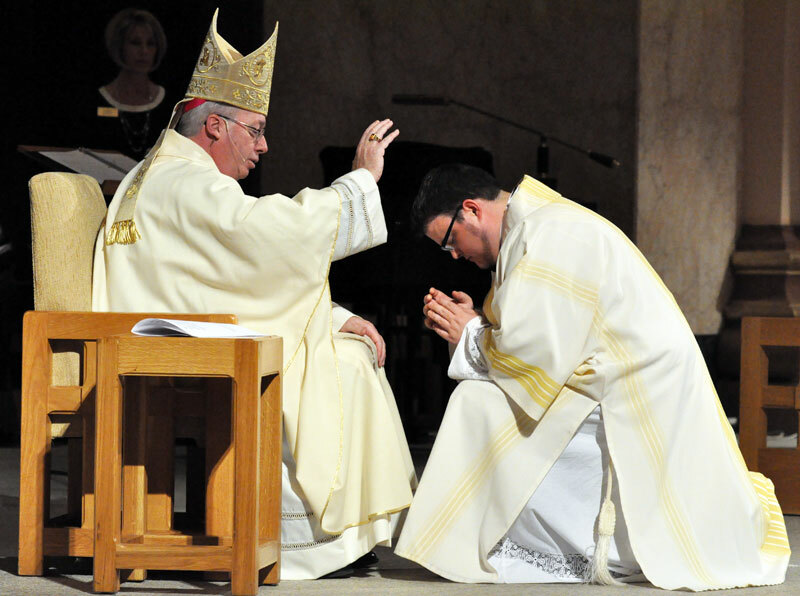 He hopes to make that gift the centerpiece of his priestly life and ministry. Love, beauty and faith are best embodied for Deacon Byrd in the Eucharist. Just as Deacon Byrd’s heart was changed in a celebration of the Eucharist in 1998, now he hopes that the Catholics who will come to the Masses that he will celebrate as a priest will likewise be transformed. On June 2, Deacon Byrd will be immersed in the beauty of the priesthood, which he has thus far only viewed from the outside. Favorite Bible verse: “I came so that they might have life and have it more abundantly” (Jn 10:10).